Ignition coil failure is an issue for all drivers eventually, and to keep your Jaguar in optimal condition it’s important that you remain aware of what to expect when it comes to ignition coil failure. It is most pressing that you know what steps to take in order to best prevent ignition coil failure from occurring prematurely, and are familiar with the common symptoms your car may exhibit if or when ignition coil failure does occur. In this article, we’ll go over the aforementioned factors, as well as helpful suggestions and solutions to the issue. Do all cars experience ignition coil failure? So, the answer to the question is both a yes and no answer; no car is immune to ignition coil failure, but certain preventive care actions can help to prevent it from occurring prematurely. 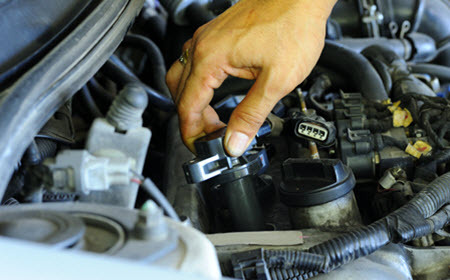 These two symptoms usually occur as the ignition coils are in their final stages and require replacement. You may experience engine stalling and misfiring or general rough driving conditions. Stalling and misfiring are often described as engine hesitation, malfunction, or seizure. Engine stalling and misfiring in any car, let alone a Jaguar, is highly unexpected by drivers, and can be frightening. It’s important for your safety that any engine stalling or misfiring is checked out right away. Your fluctuating gas mileage is normal depending on many different factors, but it can also tell you a lot about what’s going on with your engine and ignition coils specifically. Lowered gas mileage is often a symptom leading up to more severe performance issues, so it’s important to bring any suspicious changes in fuel efficiency to your reliable Jaguar automotive shop. Ignition coil failure is significantly sped up when the spark plugs aren’t working well. If spark plugs begin to wear out, it’s only a matter of time before the ignition coils do as well. Replacing spark plugs when needed is one way to spare your ignition coils the added stress, but you’ll likely need to replace both. Automotive repairs are usually stressful, unexpected, and expensive; here at Tech Plus Automotive, we take a preventive approach to keep automotive care simple, effective, and affordable. Jaguar drivers from the areas of Scottsdale, Phoenix, Paradise Valley, and McCormick Ranch, AZ, have entrusted us with their prized vehicles for years because we honor our commitment to uphold our professional standards of expertise and honesty. If you have recently noticed the signs of ignition coil failure in your own Jaguar, please call us to learn more about our shop or to schedule an appointment to address the performance issues.